A lot has changed around Elon’s campus since I first arrived three years ago. We have more buildings, new majors, and all new menu options in Elon’s dining halls. For example, there are healthy dishes at all locations, from salads and fruit to multiple protein options. I have found myself always leaving Elon Dining halls with a big smile, full stomach, and stronger friendships. I even met my best friend at Acorn Coffee Shop over two cups of coffee and chicken salad sandwiches! Not to mention friends with the dining workers, who’s beaming faces greet me each day and make me eager to return the next day. 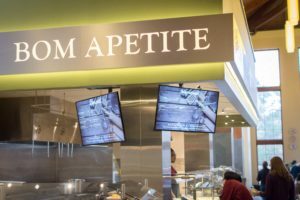 On Tuesday, February 20, I had the opportunity to walk all around campus and sample all of the great changes Elon dining has made since my freshman year. 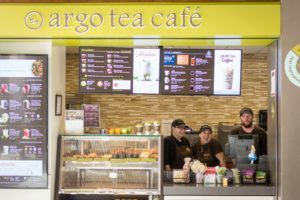 Digital menu boards give the dining halls a modern feel. When I think of Lakeside breakfasts, I picture the omelet bar and Sunday morning waffles. Upon walking in, I immediately noticed the digital menu boards featuring the menu, nutritional information, and allergens for each available dish. I was impressed by the signs around meals indicating which dishes incorporate fresh ingredients and locally sourced products. 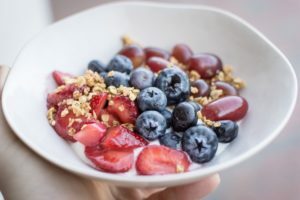 After I noticed the long line wrapped around the yogurt bar, I noticed all of the options: the fresh fruit – strawberries, green and red grapes, melon, pineapple, mango, oranges – granola and muesli, and three flavors of Chobani Greek yogurt: Plain, Strawberry and Vanilla. No wonder there was such a line. The options were amazing! After making a strawberry yogurt bowl topped with grapes and strawberries, I headed over to the Comfort station for cage-free scrambled eggs, sweet potato fries, and a small breakfast burrito. I sampled the new Sir Kensington Organic Ketchup – it was tasty, flavorful, and a healthier option! My friend had a custom omelet with bacon and onion, and a bowl of vanilla Greek yogurt topped with strawberries and granola. After we finished our breakfasts, we got cups of coffee to-go and headed over to the library! After my 12:25 class ended, I headed over to Freshii for a refreshing late lunch. Instead of opting for the Teryaki Twist like I did last year, I decided to try something new and chose the Pokii bowl. 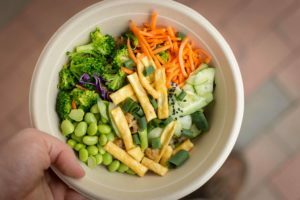 The Pokii bowl has kale, brown rice, avocado, edamame, sesame seeds, and ginger with sesame dressing and spicy yogurt sauce. I also chose chicken as the additional protein. Happy with my bright pokii bowl, I sat outside on the Lakeside Patio and devoured it. Side note: Winter Garden now has iced coffee carafes! I’ll have to keep that in mind for a hot day or whenever I’m in need of a caffeinated pick-me-up. With a full stomach, I decided to stop by Fountain Market, the grocery section next to Boar’s Head for some take-away snacks. I couldn’t believe all of the great new options that Elon Dining has to offer! 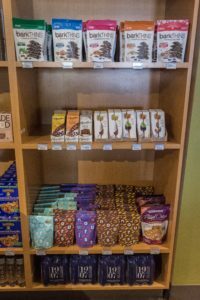 The Gluten-Free wall of snacks has expanded immensely to include multiple types of Glutino pretzels and cookies, Beanito’s Bean Chips – with flavors such as Garden Fresh Salsa, Hint of Lime, and Black Bean, and a variety pack of Glutenfreeda oatmeal featuring Maple Raisin, Brown Sugar, and Apple Cinnamon with Flax. Also, the fountain market has THREE iced coffee options now by the beverage station! As an avid coffee drinker, I love to know that there are so many places with iced coffee around campus. As someone with a heavy sweet tooth, I naturally made my way over to the dessert section. I noticed the many Ben & Jerry’s options, Hazelnut Chocolate Chip and Fudge Brownie Talenti Gelato pints, and to my delightful surprise – a large selection of Halo Top ice cream! As a healthy, low-calorie alternative to traditional sugary treats, I can finish the whole pint without ever feeling guilty. My personal favorite flavor is peanut butter cup, but other flavors available include Cookies and Cream, Mint Chip, Birthday Cake, Pistachio, and Sea Salt Caramel. Elon’s campus teems with places to study – many of which feature dining options (Acorn, Argo, Moseley, Daniely… to name a few)! Wanting to try something new, I used one swipe for tea and two small sliders. 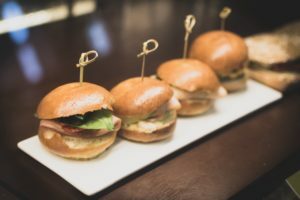 I sampled the new brioche bun slider options at Argo as well – the Turkey, Brie, and Apple and the Chicken Pesto. I highly recommend both, especially the chicken pesto. Feeling slightly under the weather, I asked the two Argo workers which teas they would recommend. Per their suggestion, I ordered a hot Carolina Honey Tea. One of them called after me as I left, “I hope you feel better!” It honestly made my day. Heading home to hang out before dinner, I walked past Acorn. 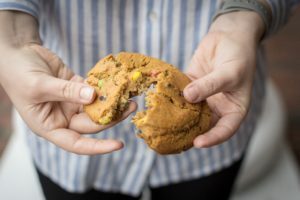 While Acorn is known for its M&M Carnival Cookie, the Acorn Delight Cookie remains my personal favorite. As a combination of peanut butter, chocolate chips, and white chocolate chips, the Acorn Delight tastes even better after being microwaved for 10 seconds. I chatted with two of my favorite workers, Joyce and Andrea, who I’ve known since the first week of my freshmen year here at Elon. Walking into Acorn is always a breath of fresh air, as I know I am always guaranteed to see familiar smiling faces, asking about my day and telling me about theirs. 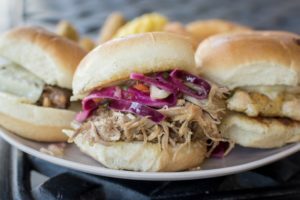 Pulled Pork sliders at Clohan! Hungry again, I met some friends for dinner at Clohan Hall. I tried Tuesday night’s dinner special: pulled pork slider with coleslaw, a side of Greenworld’s cheesy cauliflowers (which taste just like mac and cheese! ), and seasoned carrots. We sat in a big cozy booth in Greenworld and exchanged stories from our weekends. Afterwards, the three of us split a big bowl of chocolate ice cream from Clohan’s ice cream bar. It was an eventful day back in the dining hall, sampling old favorites and new dishes. Not only did I enjoy the few snacks I ate by myself, but I enjoyed hanging out and eating with friends. After all, food brings people together, and food tastes better when you eat it together.